​Mustang-II Traction Bars are here! Hello, and welcome to the Stumpy's Fab Works website. This is new and currently under construction, so please come back often to check for updates. 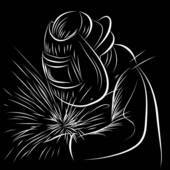 Twenty-five years ago was the first time I picked up a welder, and ever since then, welding has become a large part of my life. It started out at first by only building the things I needed, since I enjoyed it. When I began, it was only to build engine stands for my shop. This progressed into building more complex things, along with a wider variety of them. It wasn't long before I found that what I could make could be used by others as well. You probably ended up here for a couple of reasons. Most likely, you heard about me from someone about my products, although you could have stumbled upon me on accident as well. Whatever the reason, if you're looking for some kind of engine stand that you can't find anywhere, you're looking in the right place. With luck, you're like me and are trying to buy within America as much as possible, to support the country and it's people. All of my products are manufactured right in the midwest of the good old USA, using welders and other products that have been made here as well. While you're here, go ahead and take a look around to see if there's anything you might need. If you know for a fact that you need a certain engine cradle but don't see it listed, feel free to drop me an email and we can see if we can hash out the details to get one built.